2013 has brought forth more residential roofing materials than ever. Despite a rise in sales of alternative roofing materials like metal roofing, asphalt roofing shingles continue to be the number one choice by more than two thirds of American homeowners. That is something to keep in mind if you are selling your home in the future and considering installing a metal roof. Traditional shingles are the first option we will review for residential re roofing in Rochester NY. They have a single ply fiberglass construction designed for long lasting performance and durability. Traditional shingles have the least dramatic face exposure at 5″ and most 3 in 1 shingles utilize a 12″ tab totaling 36″ shingle width. Average weight per square is usually 205-240 lbs depending on shingle brand and most shingle manufacturer warranties are 25-30 years,but prorated after 5. Next, we will look at Luxury series shingles. Luxury series offers a much more dramatic look of distinction with wider tabs and taller face exposures. With two and three piece fiberglass base shingles and randomly applied tabs, some luxury shingles offer a virtual five layers of protection when applied over your roof decking. Luxury series shingles carry a greater wind resistance ratings than designer asphalt shingles and most shingle manufacturers offer a lifetime limited warranty. These can weigh in at a whopping 425 lbs per square. Unfortunately the price carries a heavy weight too, and can cost two or three times the price of an architectural shingle. Last but not least is our designer asphalt shingle. Designer roofing shingles are the number choice of homeowners installing a new roof in Rochester NY. 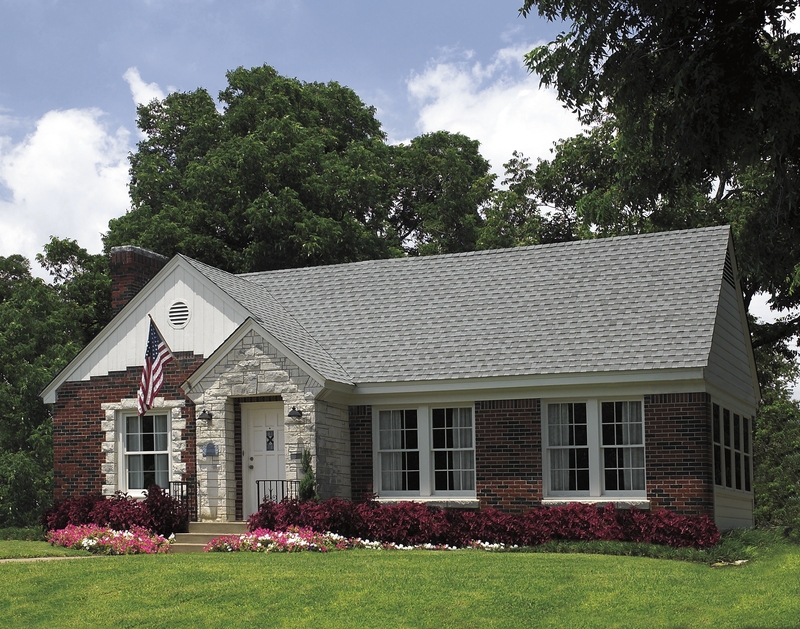 These shingles have great curb appeal and offer excellent protection from the elements. Most have a two piece laminated fiberglass base construction. Classic shades and dimensional appearance give these shingles the look of natural wood or slate. They are a great compliment to any homes exterior and they won’t break the bank. Designer shingles weigh in at 200 lbs all the way up to 300 lbs for premium designer series and most now carry a lifetime limited warranty if your installation is completed by a certified Shingle Master Company like Ron Ferris and Son. No matter which shingle you choose make sure you call a roofing contractor Rochester NY that you can trust. With offer 30 years of dedication to our community and a focus on residential roofing, we are Rochester’s factory certified roofing specialist. We have the knowledge to handle any and all of your roofing needs. Whether your project is a cedar shake tear off or new construction roofing, our master shingle applicators will treat your home like their own. We are Rochester’s cleanest roofing company and always protect your vinyl siding and landscaping while performing roof tear offs in Rochester NY. When searching for a new roof in Wayne county, Ron Ferris and Son is the best call you could ever make to protect your investment. We offer the highest quality Wayne county roofing services and have for over 30 years! Check us out and see how for over 30 years we have provided excellent customer service, superior roofing installation in Wayne county and the best roofing warranties. Ron Ferris and Son is running some specials on lifetime roofing in Wayne County, NY and we want to make sure you take advantage of the opportunity. Your home will receive the best roof possible from a Wayne county roofing contractor that you know and trust. We purchase all of our roofing materials locally and ALL of the roofing products we use are manufactured in the USA. We only install roofing materials with the highest quality asphalt, lime dust and granules of colored stone which are the best roofing components to effectively battle Wayne county weather. We complete jobs quickly and perform installations with the experience of true roofing professionals. Our roofing applicators are factory trained and certified, so hire Ron Ferris and Son today and you can relax knowing your roof is in good hands. When you call Ron Ferris and Son we will need to schedule a free roofing estimate to determine whether or not you need a Wayne county roof repair or a complete roof tear off. We have many options available to suit any roofing project that will make a dramatic difference in the appearance of any home. We have a great reputation in the community and our credentials with Certainteed roofing manufacturer are some of the very best worldwide. Very few roofers hold a wizard level applicators status like the owners and application team at Ron Ferris and Son. All of our roofing in Wayne county adheres to a stringent guideline system which is required to provide you with the roofing industries most comprehensive lifetime warranty. At RFS we are an experience,established roofing company and have seen every scenario when it comes to replacing a roof in Wayne county NY. We can compensate for any changes needed during the installation of your new roof such as a new bathroom vent. The purchase of a new roof in Walworth NY is a significant expense and project. At Ron Ferris and Son we strive to educate our clients in every aspect of the purchase of their new lifetime roofing system. Today we will focus on understanding roofing warranties. When looking for a new roof in Webster NY it involves purchasing a combination of roofing products and roofing services. That is why it is very important the home owner understands the role of the roofing contractor in Wayne County NY and the shingle manufacturer. The roofing company chosen to install the new roof should be expected to complete the work in a professional and timely manner. The roofers in Walworth, NY should care for your property and landscaping as if it were their own and always protect your siding during the removal of old roofing. The specific details of installations and timelines should be written down and agreed upon in the form of a binding contract to protect both parties. In the matter of roofing services in Wayne County NY, the contract between homeowner and the roofing contractor generally include a written warranty on workmanship.While the length of warranties may vary a good contractor will stand behind his work because he cares about his reputation in the community and the homeowners potential as a referral for more work. Clearly the good reputation of the contractor is the most reliable assurance of a quality installation. Remember you are evaluating a total package of price, quality, reputation and comfort. Installation methods that fail to follow shingle manufacturers instructions, improper fastening and certain special situations. Warranty transferability can vary so make sure to do your homework. Look for a fully transferable warranty especially if you are looking to sell your home in the near future. Ron Ferris and Son is a Shingle Master Company with the credentials to provide you with one of the most comprehensive lifetime warranties in the roofing industry. All of our applicators are factory trained and certified and each of our roofing projects must pass a stringent inspection to qualify for an extended lifetime warranty. So place your roofing in Penfield NY in the hands of Ron Ferris and Son and relax knowing over 30 years experience in roofing Rochester NY is taking care of business. Call today at (585)288-0895 for your free roofing estimate in Rochester NY or (315)524-8924 for your new roof in Wayne County, NY. When installing a new roof in Rochester NY this summer,you may be considering more than one asphalt roofing shingle and wondering whether or not the difference in materials really matters. Absolutely different roofing materials and the way they are installed can mean different things to the longevity, quality and environmental friendliness of your your roofing in Rochester NY, as well as its curb appeal. Seriously, have you ever come upon a beautiful home with an ugly or worn roof and thought how offsetting the roof was. Or how about a plain home with a slate roof or a luxury series asphalt shingle that makes you take a second look at a house you would normally dismiss. Different roofing materials in Rochester NY make a difference in how little or how much we like any given home. Aesthetically,your home’s roof is the biggest thing people notice. If you want your home to look its best, replacing a roof in Rochester NY should be at the top of your checklist. When considering roofing contractors in Rochester NY, try to find an earth friendly one. An educated contractor will be able to help you choose the right roofing materials and roofing ventilation for your specific needs. This can make a huge impact on the amount of energy used to heat and cool your home. Lowering your homes energy usage will also lower the waste that is produced in the creation of this energy. Roofing materials such as slate and tile last much longer,which means less frequent removal to landfills.Make sure to choose a roofing company in Rochester NY who recycles metal roofs, roof flashings and metal edging. As I mentioned earlier some roofing materials and the way they are installed last longer than others. That is why it is important to focus not only on the price but also the quality of materials and services. Roofing in Wayne County is very expensive and if you consider the costs of a more frequent replacement, the costlier, quality materials and services seem like a bargain in the long run. All in all,yes different roofing materials can have a huge impact on your new roof and are worth considering carefully.When you are ready for a new roof, contact Ron Ferris and Son.We have been roofing Rochester NY for over 30 years. Our factory trained and certified credentials allow us to provide you with the most knowledgable applications and the most comprehensive lifetime shingle warranty. So call Ron Ferris and Son today for a free roofing estimate in Rochester NY at (585)288-0895 or (315)524-8924 for a free estimate on a new roof in Wayne County NY.